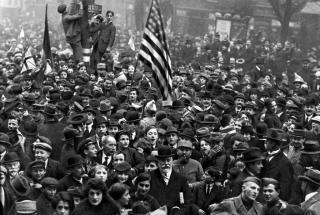 The armistice – an agreement made by the Allies and Germany to stop fighting – came into effect at 11am on 11November. This meant that the First World War wasfinally over. Celebrations and parties were held across Wales. Sadly, the fighting continued up until the ceasefire and many lost their lives on the final day of the war. Able Seaman Richard Morgan from Kilgwrrwg, Monmouthshire, is believed to be the last Welshman to die in active service on that day when he drowned while serving on HMS Garland.